Aaron Blaisdell is a Professor in Learning & Behavior and Behavioral Neuroscience in the UCLA Psychology Department. 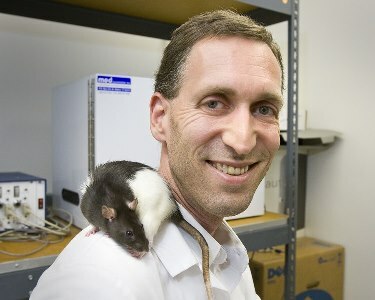 He presides over the Comparative Cognition Lab, studying cognitive processes in rats, pigeons, hermit crabs, and humans. After receiving his BA and MA in Biological Anthropology (at SUNY Stony Brook and Kent State University, respectively), Aaron realized that animal cognition was even more interesting than dead humans. So he trekked on over to SUNY Binghamton for his Ph.D. in Experimental Psychology with Ralph Miller, where he studied learning, memory, and temporal cognition in the rat. This was followed by a brief stint as an NRSA Postdoctoral Fellow with Bob Cook, an expert on Avian Visual Cognition at Tufts University, where he learned how pigeons perceive and think about the world. In 2001, he emigrated to the climatological and cultural paradise of sunny LA where he has remained ever since. A second interest of Aaron’s is in how human ancestry and evolution can inform us about health and well being in the modern world. He is currently studying the interaction between diet and cognition. He is a founding member and Past President of the Ancestral Health Society, Past President of the International Society for Comparative Psychology, an Editor-in-Chief of the Journal of Evolution and Health, and a member of the Brain Research Institute, the Integrative Center for Learning & Memory, and the Evolutionary Medicine program all at UCLA. We talked about a lot of different things, including reasoning in rats, sensory preconditioning, how diet affects cognition, representation in rat memory and Aaron's crowdfunded research proposal.